The Philips LFH7430 SpeechExec app is designed to fit perfectly into the Philips SpeechExec Enterprise suite. Recording, editing, and sending dictation files from your iPhone offers mobile flexibility and reduces document turnaround times. 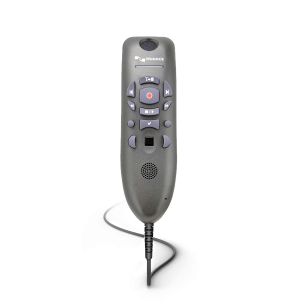 Productivity on the go with a professional dictation solution. 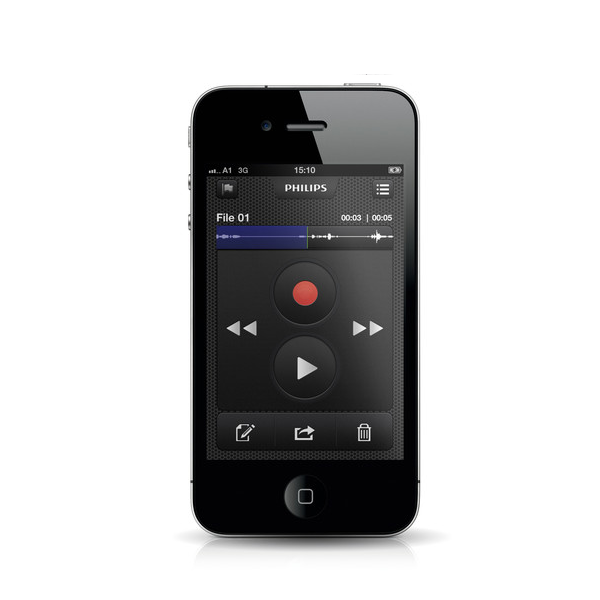 The Philips LFH7430 Digital Dictation App for iPhone is designed to fit perfectly into the Philips SpeechExec Enterprise suite. Recording, editing, and sending dictation files from your iPhone with the Philips dictation app offers mobile flexibility and reduces document turnaround times. 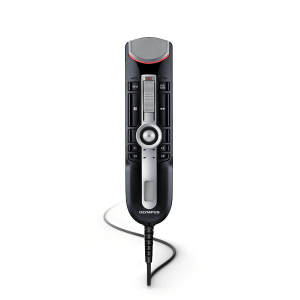 The display shows all recording functions, and the main interface allows the user to record and navigate within recordings. Additionally, users can prioritize a recording, define a keyword and/or a category, or simply edit the recording name. The clear user interface makes it fast and easy to find what you’re looking for. It guides you through the dictation and upload process quickly and intuitively. To avoid people accidentally getting access to your audio files, the highly secure Philips Recorder for Smartphones optionally offers the capability to encrypt dictation files. In addition, the voice dictation app for iPhone can be locked via PIN code. Shake, record, send: the Express Mode is quick and easy. Shake to record, and shake again to save your recording or have it sent immediately to your SpeechExec Mobile server (only available for iPhone). The Philips SpeechLive dictation app takes dictation workflow to the cloud, with all its great benefits. Dictations can be safely uploaded and downloaded from anywhere in the world. End-to-end double encryption protects recordings from unauthorized access. SpeechLive works seamlessly with all Philips input devices, connects with SpeechExec software and adapts to your company’s working structure. The Philips Recorder for Smartphones takes full advantage of the touch interface. It offers editing functions such as insert, overwrite, and append for professional recording control. Attach a photo directly to your dictations to increase the accuracy and validity of your dictation files. Attached photos are directly tied to your recordings. With the status bar you always know the exact connection status to your cloud storage. Your dictation and system status are now visible on one screen. Find dictations in your cloud storage within seconds. Simply filter dictations according to their status progress (pending, progress, finished) and enhance your efficiency. The Philips Recorder for Smartphones turns your smartphone into a wireless digital dictation recorder. Record dictation files at home, in the office, on a plane, or anywhere you need to record and send voice files. The ability to send dictation files through wireless transfer decreases turnaround time and dramatically increases personal productivity. 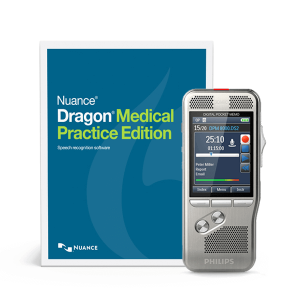 With the Philips Recorder for Smartphones you can send recordings to your SpeechExec solution via email, FTP, the Philips SpeechLive dictation app, or directly to your company network. The audio files will automatically appear in your transcribe to-do list. The SpeechExec dictation recorder routes files to their defined target destinations using either SpeechExec Mobile Server, BlackBerry Enterprise Server or SpeechLive. Customers have the choice of either hosting their own Server or take advantage of the Philips SpeechExec Dictation Hub service which provides a SpeechExec Mobile Server hosted by Philips. 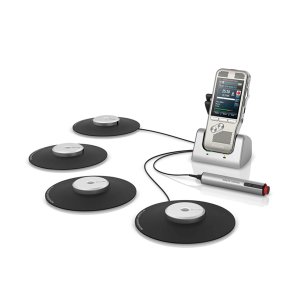 By supporting up to five Mobile Server settings at different locations, the Philips Recorder for Smartphones guarantees highest flexibilty when dictating in different environments is a must. With the Philips SpeechLive dictation app for iPhone, dictation files can be sent from anywhere in the world, independent of where you are, 24 hours a day, 7 days a week. Price is for 1 year annual subscription for Philips LFH7430 SpeechExec App and SpeechExec Enterprise service.